As we work with schools and policy-makers to successfully implement student-centered learning models, we often hear concerns around building community support. Time and again we come back to the idea that communicating to others the why, the how, the what, and the when is key to a successful and sustainable transition to new, innovative learning environments. We also nearly always come back to the challenge that knowing communications is important is one thing, but doing it effectively is another thing entirely. As a result, we have released two papers, respectively in collaboration with The Learning Accelerator in 2017, and with ExcelinEd in early 2018. 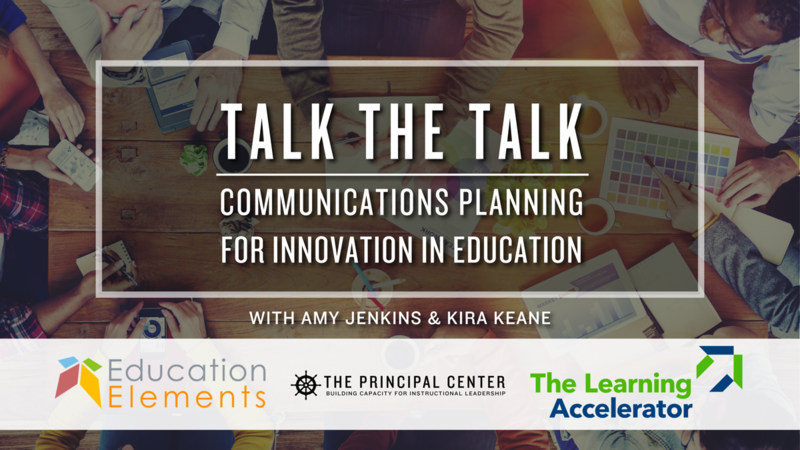 Communications Planning for Innovation in Education: How to communicate about your blended & personalized learning initiatives, co-authored by Janice Vargo and Kira Keane, is a guide to creating informed conversations and preventing miscommunication about blended learning and personalized learning. The paper streamlines the planning process and clearly lays out the key steps for effective communications planning for those just beginning their journey, as well as practitioners who have been implementing for several years. Perhaps even more importantly, it includes artifacts you can use from districts across the country. Communicating Personalized Learning to Families and Stakeholders: Terminology, Tools and Tips for Success, co-authored by Amy Jenkins and Karla Phillips, is a guide for how to talk about personalized learning in a way that shows all stakeholders the vision and the need for change. The paper provides readers with message testing results, outlines the best messengers, shares real-world examples, and provides a set of lessons learned. Hosted by the Principal Center, this webinar will take place on Thursday November 15th, 2018, 3:00pm EST / 2:00pm CST / 12:00pm PST. In this webinar, you'll get expert tips and tools for communications planning, as well as real-world examples from districts across the country that are implementing blended and personalized learning. Eager to learn more about the topic, and want to get a taste of what this webinar will teach you? Check out this podcast by the webinar presenters, Amy and Kira: Strategic Communications for Families & Stakeholders. Is Communications the Secret Sauce for Innovation?